1940s – Make Mine Criterion! It’s been a while since MMC! has offered a “Trailer Tuesday” post. I’m going to try and make “Trailer Tuesday” a monthly feature with aims at celebrating trailers for upcoming movies, films recently announced for spine numbered editions, and trailers that caught our eye (regardless of the feature’s quality). The last month has offered a lot of trailers that are pure eye candy, but the most stunning belongs to Luc Besson’s Valerian and the City of a Thousand Planets (2017). As a fan of the originals BDs (read: French comic books) by author Pierre Christin and artist Jean-Claude Mézières, I must say that Besson’s realization of the series’ far-future world is impeccable and, as often happens in his other films, it may likely carry the film over any weaknesses in its plot or performances – fingers crossed! The National Film of Board of Canada sometimes gets a bad reputation for being … educational! And if someone were to come up with a title parodying the NFB’s edifying aims and culturally sensitive nationalism, How to Build an Igloo could easily be that film, but Douglas Wilkinson creates a fascinating short that unpacks the ingenious design and skillful handiwork of this modest architectural wonder. How to Build an Igloo (1949) is another somewhat ubiquitous title, a film that many Canadians, including me, were exposed to as children, although most of us have never put these instructions into practice! This classic short film shows how to make an igloo using only snow and a knife. Two Inuit men in Canada’s Far North choose the site, cut and place snow blocks and create an entrance–a shelter completed in one-and-a-half hours. The commentary explains that the interior warmth and the wind outside cement the snow blocks firmly together. As the short winter day darkens, the two builders move their caribou sleeping robes and extra skins indoors, confident of spending a snug night in the midst of the Arctic cold! If the Criterion Collection were to devote a spine number to a single NFB filmmaker, the consensus pick would likely be experimental animator Norman McLaren. The Scottish-born filmmaker received various honours over his career, including an Oscar (and 4 more nominations), a Winsor McCay Award for lifetime achievement in animation, 3 BAFTA awards, a Silver Bear and Silver Plaque at Berlin, and a short film Palme d’Or at Cannes. 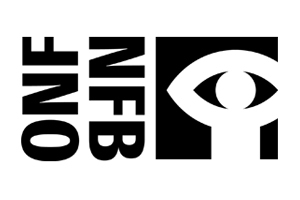 The NFB headquarters in Montreal is named after McLaren, as is the electoral district it is located within, and the Film Board commemorated its 70th anniversary with a comprehensive DVD collection of McLaren’s work, Norman McLaren: The Master’s Edition. That set, despite being somewhat confusing in its organization, is just waiting for a blugrade by Criterion. Until such time as that happens, a Criterion Collection set devoted to the NFB would necessarily need to include at least a sampling McLaren’s work. Provided here are three of McLaren’s finest films – Begone Dull Care (1949), winner of a Silver Plaque at the Berlin International Film Festival; Neighbours (1952), Oscar-nominated in the Short Subject category and Oscar-winning as a Documentary Short; and Blinkity Blank (1955), winner of the Short Film Palme d’Or and a BAFTA award. In this extraordinary short animation, Evelyn Lambart and Norman McLaren painted colours, shapes, and transformations directly onto their filmstrip. The result is a vivid interpretation, in fluid lines and colour, of jazz music played by the Oscar Peterson Trio. In this Oscar®-winning short film, Norman McLaren employs the principles normally used to put drawing or puppets into motion to animate live actors. The story is a parable about two people who come to blows over the possession of a flower. This experimental short film by Norman McLaren is a playful exercise in intermittent animation and spasmodic imagery. Playing with the laws relating to persistence of vision and after-image on the retina of the eye, McLaren engraves pictures on blank film, creating vivid, percussive effects.